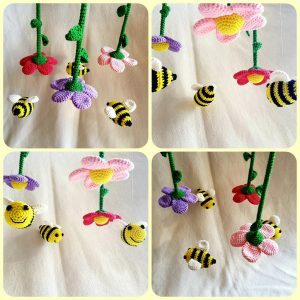 It’s done and I’m really proud of this beautiful Baby Mobile – flowers and bees! It has become exactly as I have imagined and that means something. Finally a mobile, which makes sense from the baby’s perspective from below. This was definitely not the last thing I crocheted. You can find the instructions for the bees here. The instructions for the flowers are here .